"The Teenage Mutant Ninja Turtles (often shortened to TMNT or Ninja Turtles) are four fictional teenaged anthropomorphic turtles named after four Renaissance Italian artists. They were trained by their anthropomorphic rat sensei in the art of ninjutsu. From their home in sewers of New York City, they battle petty criminals, evil overlords, mutated animals, and alien invaders while attempting to remain hidden from society. They were created by Kevin Eastman and Peter Laird. The characters originated in comic books published by Mirage Studios before expanding into cartoon series, films, video games, toys, and other general merchandise. During the peak of the franchise's popularity in the late 1980s and early 1990s, it gained worldwide success and fame." "The Teenage Mutant Ninja Turtles first appeared in an American comic book published by Mirage Studios in 1984 in Dover, New Hampshire. The concept arose from a humorous drawing sketched out by Eastman during a casual evening of brainstorming and bad television with Laird. Using money from a tax refund, together with a loan from Eastman’s uncle, the young artists self-published a single-issue comic intended to parody four of the most popular comics of the early 1980s: Marvel Comics’ Daredevil and New Mutants, Dave Sim’s Cerebus, and Frank Miller’s Ronin. The TMNT comic series has been published in various incarnations by various comic book companies since 1984. The Turtles started their rise to mainstream success when a licensing agent, Mark Freedman, sought out Eastman and Laird to propose wider merchandising opportunities for the franchise. In 1986, Dark Horse Miniatures produced a set of 15-mm lead figurines. In January 1987, Eastman and Laird visited the offices of Playmates Toys, a small California toy company that wanted to expand into the action-figure market. Development was undertaken by a creative team of companies and individuals: Jerry Sachs, ad man of Sachs-Finley Agency, brought together the animators at Murakami-Wolf-Swenson headed by Fred Wolf. Wolf and his team combined concepts and ideas with the Playmates marketing crew, headed by Karl Aaronian, vice president (VP) of sales Richard Sallis, and VP of Playmates Bill Carlson. Aaronian brought on several designers and concepteur and writer John C. Schulte, and worked out the simple backstory that would live on toy packaging for the entire run of the product and show. Sachs called the high concept pitch ""Green Against Brick"". The sense of humor was honed with the collaboration of the MWS animation firm's writers. Playmates and their team essentially served as associate producers and contributing writers to the miniseries that was first launched to sell-in the toy action figures. Phrases like ""Heroes in a Half Shell"" and many of the comical catch phrases and battle slogans (""Turtle Power!"") came from the writing and conceptualization of this creative team. As the series developed, veteran writer Jack Mendelsohn came on board as both a story editor and scriptwriter. David Wise, Michael Charles Hill, and Michael Reaves wrote most of the scripts. The miniseries was repeated three times before it found an audience. Once the product started selling, the show got syndicated and picked up and backed by Group W, which funded the next round of animation. The show then went network, on CBS. Accompanied by the popular Teenage Mutant Ninja Turtles 1987 TV series, and the subsequent action figure line, the TMNT were soon catapulted into pop-culture history. At the height of the frenzy, in the late 1980s and early 1990s, the Turtles' likenesses could be found on a wide range of children's merchandise, from Pez dispensers to skateboards, breakfast cereal, video games, school supplies, linens, towels, cameras, and even toy shaving kits. While the animated TV series, which lasted for 10 seasons until 1996, was more light-hearted, the comic-book series continued in a much darker and grittier tone. 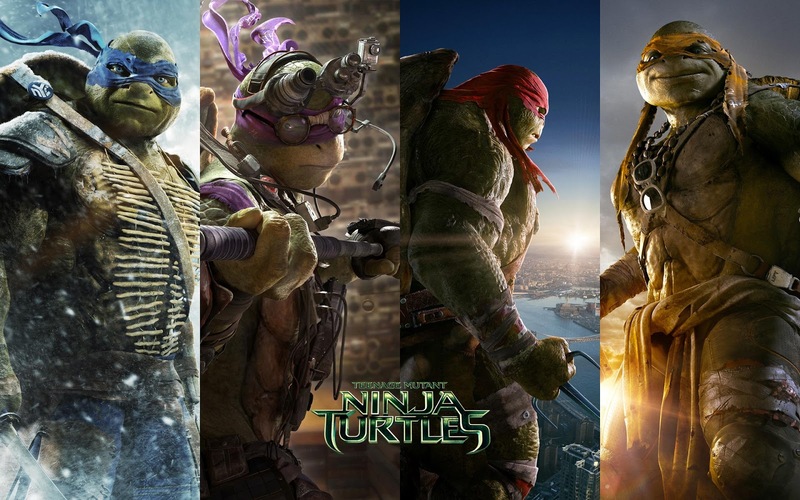 In 1990, a live-action feature film was released, with the turtles and Splinter being portrayed by actors in partially animatronic suits created by Jim Henson's Creature Shop. The film became one of the most successful independent films and spawned two sequels, as well as inspiring a three-dimensional animated film set in the same continuity, which was released in 2007 under the title TMNT. After the end of the cartoon series, a live-action series in the vein of the films was created in 1997 in conjunction with Saban Entertainment. The series was called Ninja Turtles: The Next Mutation and introduced a fifth, female turtle called Venus de Milo. However, the series was largely unsuccessful and was canceled after one season. The property lay dormant until 2003, when a new animated TV series also entitled Teenage Mutant Ninja Turtles began to air on Fox Box (4Kids TV). The series storyline stuck much closer to the original Mirage comic book series, but was still less violent. It lasted for seven seasons and 156 episodes, ending in February 2009. On October 21, 2009, it was announced that cable channel Nickelodeon (a subsidiary of Viacom) had purchased all of Mirage's rights to the Teenage Mutant Ninja Turtles property. Mirage retains the rights to publish 18 issues a year, though the future involvement of Mirage with the Turtles and the future of Mirage Studios itself is unknown. Nickelodeon has developed a new CGI-animated TMNT television series and partnered with fellow Viacom company Paramount Pictures to bring a new TMNT movie to theaters. The TV show premiered on Nickelodeon on September 29, 2012. The live-action film, produced by Platinum Dunes, Nickelodeon Movies, and Paramount Pictures, directed by Jonathan Liebesman, and produced by Michael Bay, was released on August 8, 2014."